F100 Qt Large Series Hydraulic Breakers – The F100 is built to break the unbreakable. The F100’s one-piece enclosure reduces noise levels making this hammer a perfect choice for use in noise sensitive environments. When you need to move mountains call on the F100. 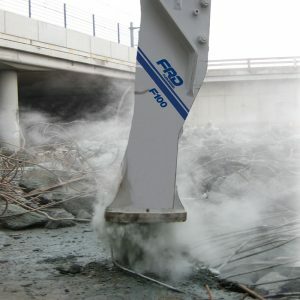 This hammer is the largest in the F Series built for use on excavators in the 72-110 ton class. As large as this hammer is, we still build in the quiet technology you have become accustomed to. Our blow frequency adjuster tailors the carrier and hammer to your workload improving overall efficiency. Upper and lower seal retainers protect against cylinder failure due to contamination. Retainer pins are reversible to double their life and reduce parts maintenance. All hammers come complete with our exclusive Pro-Pak for ease of installation. The Pro-Pak includes hose whips, mounting hardware, standard working steel and tool kit and operating manual at no additional charge. Impact energy class 15,000 ft. lbs. The content of these specifications are subject to change without notice.